It’s the absolute unfettered state and pristine condition of this frozen desserts store that strikes me ”“ that and the cute pink and white cow that seems to be floating in glee right above the store’s signage. 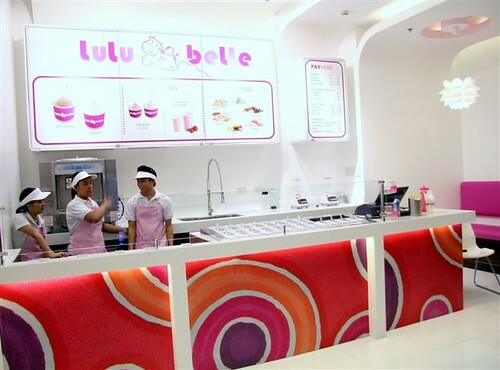 Lulubelle is a store for the frozen dessert aficionado. Of course they offer the dessert-of-the-moment ”“ frozen yogurt ”“ but it’s not exclusively devoted to it. An expansive array of toppings is vibrant in their variety, ready to crown scoops of ice cream, swirls of frozen yogurt, or to blitz into a personalized smoothie. Here, owners Joji Yujuico, Yoli Celdran, and Isabel Celdran decided to make creating a frozen dessert more interactive and enjoyable. 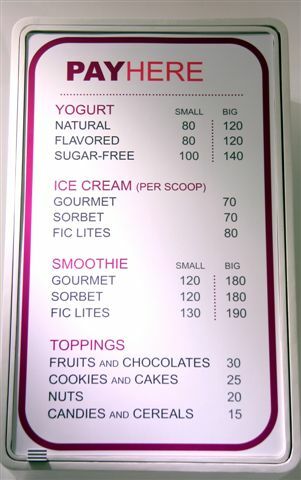 There are two types of frozen yogurt available here: natural, which is the same one served at Lulubelle’s sister company, The Ice Cream Bar (Flavors by FIC), and tart. “The natural is the slightly sweeter one like an ice cream, so that it also appeals to children, and the tart has that tang characteristic of yogurt. It’s mixed with fruit.” Yoli tells me. To illustrate, if I ask for the natural yogurt (as seen on signboard), I’ll get the typical white frozen yogurt softserve (slightly sweet, but with enough tang and rich body to remind me that it’s frozen yogurt and not ice cream). If I ask for flavored, I’ll get the pink and white serving seen above, (tarter than the natural, its tang lingers along with a pleasant berry aftertaste). As for the sugar-free, that’s coming soon, but it will primarily be regular, unflavored frozen yogurt. From the options offered, it’s almost impossible to count just how many frozen desserts I can create here. Like a mad scientist, I’m already dreaming of mixing queso (cheese) ice cream with yogurt to make one (funky) smoothie, pairing black sesame ice cream with a granola-nut-banana topping, or what about a natural frozen yogurt cup sprinkled with malt balls? 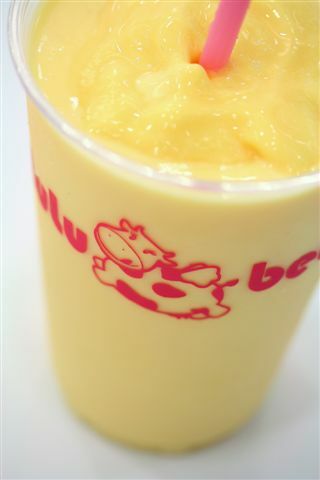 This is a mango sorbet smoothie ”“ “It’s my favorite!” Yoli says excitedly ”“ it has a very distinct yogurt-y taste and tang and it’s so creamy that I can almost fool myself into thinking that I’m drinking a mango milkshake. What you see on the cover photo of this post is a calamansi sorbet smoothie. It has no ice cream ”“ only frozen yogurt — so it’s more fluid and refreshing than say, an ice cream smoothie. It’s cold enough to give me brain freeze but tangy enough to jolt me out of it. No wonder Lulubelle has wings. Healthy and Heavenly indeed. I feel that the owners did not take time to proof read the menu. I was with my family from the US when we came to the store over on Monday. It VERY DISAPPOINTING AND I FELT THAT the INTELLIGENCE OF MY FOLKS WERE INSULTED!!! The pricing of the toppings- A total rip off! When we are about to make a payment, they told us that “fruits and chocolates” which i expected to be just 30 pesos became 60 pesos when i odered a fruit topping and a chocolate topping, as i pay the insisted that the menu clearly states that it is a “per topping price”. I think that the consumers are being fooled and ripped off by the owners for not being true with what’s printed on the price list. I challenge all the readers if your understanding would be the same as the owners…Even my 7 year old nephew clearly understands what is on the menu. w00t! It’s in Rockwell! Thank God. This is a place I can actually go to and try for myself. I’ve tried their mango sorbet and it’s absolutely delightful! Can’t wait to try their other concoctions! This place is absolutely delightful! I’ve tried their strawberry smoothie and its to die for! this is the best frozen yogurt i’ve ever had in my entire life! We (Brian and myself) went there today after eating at Pepper Lunch. I ordered a Large Mangoes and Cream Smoothie and a small strawberry-flavored fro-yo. Lori, they were good! I am so coming back for more this weekend and every weekend afterwards. They put a big dollop of fro-yo into the smoothie, so there was a distinct tartness to the drnk. Yum! It was kinda funny, though, because I was only planning on getting the smoothie, but the FIC ice cream was SO hard that the staff was having a hard time getting the proper amount out of the tub! 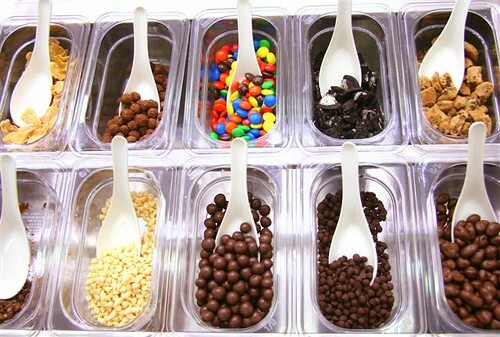 So, since I was waiting, I decided to order something easier to serve; the flavored fro-yo. This is the one in Rockwell right? I thought their frozen yogurt was one of the worst I’ve had! I ordered the plain version and the taste was completely bland and watered down! There was barely any tartiness and the texture was no smooth at all. I tossed mine after a few spoons which normally I would consider a sin in the land of frozen yogurt but it was just too unbearable to continue. Based on all your comments, I would like to think I got a lemon so maybe I’ll give it another shot. Hi, Jill! 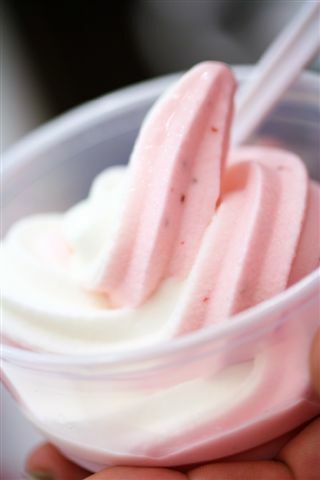 If you want the tart kind, try their flavored fro-yo, it’s strawberry-fic! I went there with my fiancé again today and went in TWICE after camping out at about 10-11am. LOL. I met Joji, such a nice lady. Breakfast was a large “twist” which is the natural and flavored twirled together. Then, before going home, I ordered another large twist and 2 large smoothies to go. One smoothie was mangoes and cream and the other was mango sorbet. Yes, I love mangoes I swear, if they come up with banana yogurt, I’ll just keep going back! I’ll do a strawberry and banana twist. Yay, something near me! I’m in Power Plant at least once a week, so I will try this soon. The place looks adorable! Tried there yogurt, didnt like it at all. Yogurt isnt smooth and melts too easily. I will be trying the twist with banana smoothie this weekend. Will also try natural with banana smoothie. Tee-hee. I just get bananas as a topping instead of going for the smoothie. I find myself ordering up to 5 big orders of the strawberry-natural twist to go at least once a week. And I go every week. Wala na, addicted na ako. They have blackberry frozen yogurt! I ordered it as a smoothie and couldn’t gt enough of it! Btw, found out that yogurt and yakult are good for taking away symptoms of stomach flu. This is the worst frozen yogurt brand. It was so sour and the texture was so watery. di ko type! amoy paa! and kesong puti..yuck! its so cheesy smelly! hate it!